As I’ve been working my way through the institutional archive I came across some personal papers of Dr F Hilliard. At some point the records were catalogued as part of the IOE’s own archive collection but it was recently decided that the collection should be removed and recatalogued as a standalone deposited archive. This list is now complete and available online via the online catalogue. Unfortunately we know very little about Dr Hilliard apart from the fact he was the Senior Lecturer in Religious Education at the Institute of Education in the 1950s and 1960s. The collection comprises just one box but is full of interesting papers regarding the provision of Religious Education during this period. The collection includes information on a wide range of issues regarding religious education (or instruction) including research projects, courses and teaching of the subject in the classroom. 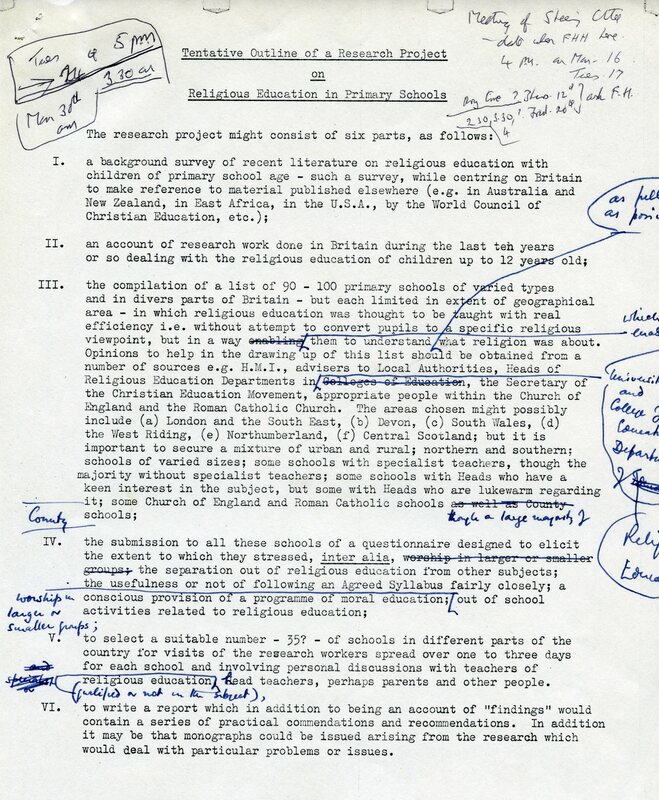 Particularly interesting are papers relating to a research project based here at the Institute of Education 1957-1959 which sought to gather ‘systematic information from teachers about the religious ideas and attitudes of children in the 11+ to 14+ age group’. This file includes responses from teachers providing details on Church attendance, religious content in assemblies and children’s attitudes to religion. One file contains correspondence with, and associated papers of, the Institute of Christian Education at Home and Overseas, now the Christian Education Movement. Founded in October 1935, the body aimed to promote Christian education at home and overseas by drawing together educationalists and others for the study of Christian teaching in all its aspects; by making known the sources of help available to teachers and others; and by giving direct help to members through a personal advisory service. The main archive is held at Birmingham University but the papers in Hilliard’s collection includes correspondence with Hilliard as a Council member. The archives contain a wide range of resources on religious and moral education. A full list can be found by searching the online catalogue. This entry was posted in Library and Archives and tagged archives, religious education. Bookmark the permalink.